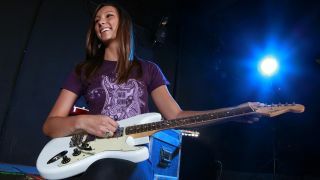 Fender has thrown its not-inconsiderable weight behind Learn to Play Day, an annual event which offers thousands of free lessons to beginner or lapsed musicians across the UK. The guitar manufacturer will be hosting a Learn To Play Day at The Gallery Soho, located at 125 Charing Cross Road, London, WC2H 0EW from 10 a.m. to 6 p.m. on Saturday 12th April. Held in conjunction with the Registry of Guitar Tutors (RGT), the day will be an open house for anyone interested in the guitar, with specialists and teachers on hand to offer advice on learning the instrument, plus a range of Fender guitars to try through private headphone stations. Absolute beginners will be particularly welcome and will receive a free, short introductory lesson from one of the Fender team or one of RGT's certified tutors. Guests throughout the day will include celebrities not associated with the guitar, entering the spirit of the day by taking their first steps on the instrument. Learn To Play Day is a national event organised by the Music for All charity to inspire new and lapsed musicians to take up playing an instrument. The Gallery Soho has views down Denmark Street, London's world-famous music shop destination, and many of the shops on the street will be supporting the day's activities. Full details of all the 2014 National Learn To Play Day events and participating venues can be found at www.learntoplayday.com.